Earlier this week we had the opportunity to participate in a 7gypsies webinar. If you are a store owner and not taking advantage of these webinars you are really missing out. 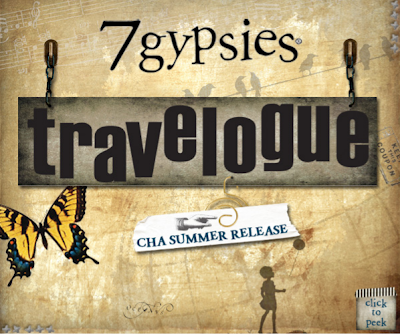 Before each major release retailers have the opportunity to get the first look at 7gypsies latest products along with the inspiration on how the line came to be and detailed information on each item. Donna and Steve Smylie, the creative genius of 7gypsies, once again didn't disappoint and came up with this fabulous collection of items. For a sneek peek at the collection check out the "Look Book".....and be sure to let your favorite scrapbook store know your favorites. Items will be coming out July-September so be on the look out. Next week Paula and I will let you know our favorites. We will also show you some of the inspirational projects created by the 7gypsies design team using the new line. We think we have the best design team and can't wait to show you what they came up with. Another cool bunch of goodies! I just pre-ordered a lot of it this morning! So excited! Thanks for the peak. My favorite is the metro paper, can't wait to get my hands on that one! Ohhh, I love it all. The Gypsies always have the best products! I'm making room for it now because I'm buying one of everything! I just love everything!! You gals have the coolest stuff!! Fabulous (as always)!!! Can't wait to play with all these new goodies.